UK pay or earnings seems to have reached the main stream media again. By my calculations Average Whole Economy Annual Earnings are increasing at a rate of 1.7% with inflation over the same period at 2.0%. So on the whole the average punter’s purchasing power continues to be eroded. To be honest I can’t say I'm surprised and think this is going to continue for a long time yet. As the world continues to globalise then the difference between poorer salaried and richer salaried countries must close. The Private Sector is fairing a little better than average and has kept pace with inflation having risen by 2.1%. Austerity does look to be biting the public sector though with increases of 0.8% which is well below inflation. The chart below shows the wider real adjusted for inflation UK earnings story. 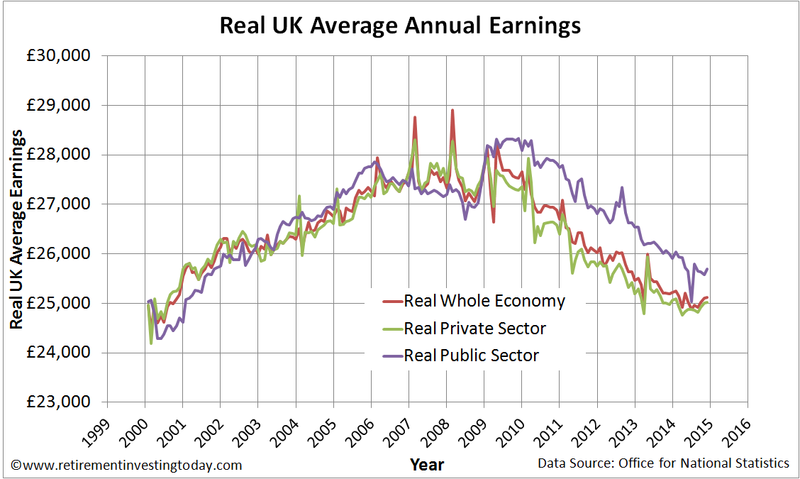 The summary is pretty simple – real UK earnings for both the public and private sectors are still well below those of 2007 to 2009. Though is that a sustainable uptick I can start to see beginning to occur before me? Given what I’ve said above I’m not convinced. 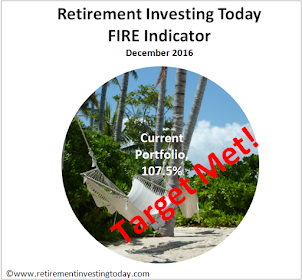 For anyone seeking Early Financial Independence, giving the option of Early Retirement, finding methods to increase earnings is extremely important. Importantly this does not have to mean increasing your day job earnings but instead can involve a new business, a second job, a side hustle, even selling stuff you no longer need now that you’ve opted out of consumerism so think creatively. So why is it important? 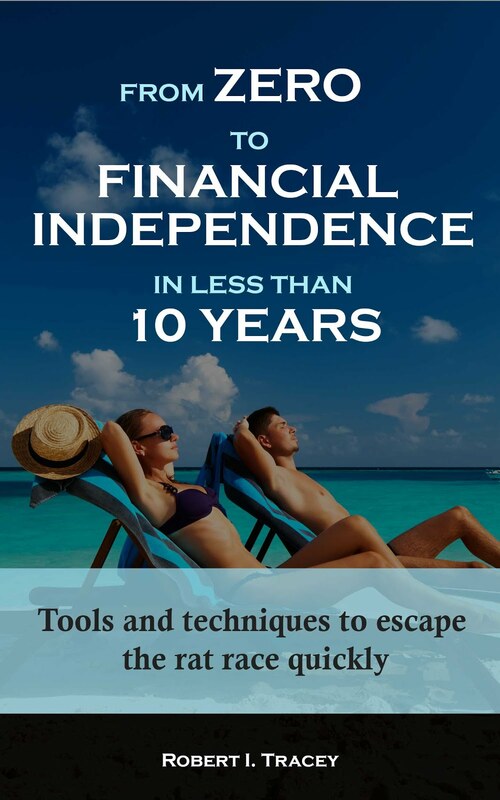 I believe there are 3 elements to reaching the Financial Independence – generating cash savings, investing those savings to gain a return and then understanding how much wealth you need to accrue and how to manage it before calling it a day. As I continue on the 8th year of my rapid journey to Financial Independence I really cannot emphasise just how important generating cash savings is and has been. Maybe the chart below which shows the annual wealth gain I’ve made from saving and investing will reinforce it. 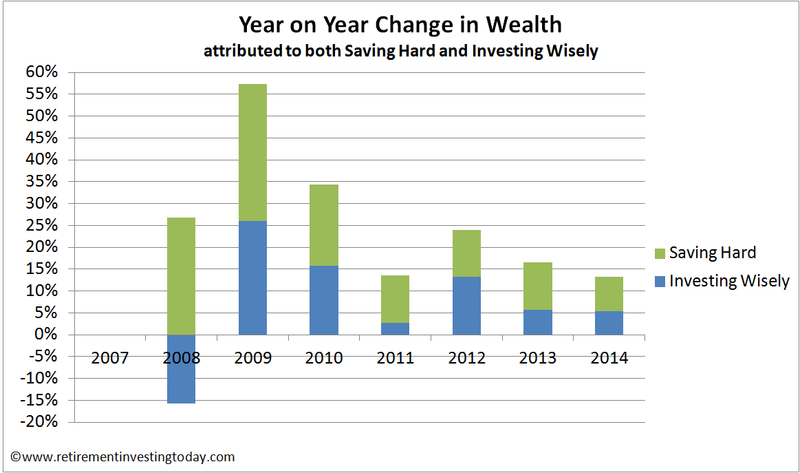 In every year bar one wealth creation from savings has beaten wealth creation from investing. As someone who today has 81.1% of the wealth required to call it a day I’m amazed this is still occurring. Certainly, when I started on this journey I really thought Compound Interest would be doing the work by now. So how can we increase our cash savings rate? There are only 2 ways that I’ve found to do this - Spend Less or Earn More. Continually working at methods to Live Well Below Your Means will certainly have a big impact and it’s a method that is also 100% in your control however every Pound (after tax) that you can increase earnings by can be fully invested providing you don’t increase your standard of living. To demonstrate I’ve personally chosen to maximise my earnings via a career. Last year I managed to seize an opportunity and just asked for a big pay rise of 44%. Which was granted. (Note: It wasn’t quite as simple as that and my company have certainly taken their pound of flesh but the increase is real.) After correcting for a tax error which should have been paid in 2013 but was instead recovered by HMRC in 2014 my savings amount when measured in pounds, shillings and pence was increased 67%. So a 44% pay increase resulted in a 67% savings rate increase. I’m not in a position to ask for an increase this year however given me delivery performance last year I fully expect an above inflation increment in the next few months. Something I’d be content with given last year’s jump. Have you managed to increase your earnings above inflation in the last year? If you did how did your savings rate change because of it? Average Whole Economy Annual Earnings is the ONS KAB9 dataset multiplied by 52. Average Private Sector Annual Earnings is the ONS KAC4 dataset multiplied by 52. Average Public Sector Annual Earnings is the ONS KAC7 dataset multiplied by 52. Hi RIT, that 44% pay rise is incredible! We don't even hear rumours (or even legends...) of such a thing happening in our company, although I guess a step up to a European/Global role could command such an increase. Last year, after years of hard graft and persistently mentioning my virtually non-existent pay rises, I got a 13% increase which for me is a very large increase, not one that I've had before and am somewhat unlikely to receive again in the near future! Fingers crossed that I will get at minimum a performance related pay rise, though I have no idea how much this could be as it changes year on year - sometimes, it's been as little as 1.5% and not everyone gets one... I should find out next month. Hi weenie, many congratulations on the 13%. Given the average increases across the UK I fear we are probably in the minority and should be a little thankful. Both increases are certainly far better than a poke in the eye with a pointed stick. I think you're right, you're certainly in the minority on with that amount. I got a 3% increase in my base salary, which is better than most and due to working in Sales, I'm lucky enough to be able to increase it by increasing my teams performance. Luckily, over the last 2 years we've done just that. In 2013, my income through work (salary and commission) went up 6.2% from the year before, and for 2014 it went up 12.8%. I was delighted to find that out. I have a feeling that this year it'll go up in the high single digits again as I plan to clean the board with my bonuses, but we'll have to see how that goes. My manager knows that I'm planning on retiring by the time I'm 40 so I don't have as much leverage to ask for a promotion if I didn't tell her my plans. It's just the way I am though. Who knows though. If I clean the board with bonuses this year, I might ask the question, what do I have to lose! And I pretty brilliant at my job! Thanks for sharing the info, it's a very interesting topic. Just to say that your disappointment in just how relatively little investment returns contribute to overall wealth generation matches my own. Whilst I wouldn't take issue with "the miracle of compound interest", you hardly ever hear mention of the corrosive effects of inflation, or indeed of intermediary charges, in the same breath! So maybe it's not such a big surprise!